A luncheon in Girard Fountain Park after the Oct. 5, 2007, dedication of Keys To Community, a nine-foot bronze bust of Benjamin Franklin by sculptor James Peniston. Not to be confused with Stephen Girard Park in south Philadelphia. Girard Fountain Park is a 0.15-acre (610 m2) pocket park in the Old City neighborhood of Philadelphia, at 325 Arch Street. It is open to the public during daylight hours and is maintained by the Philadelphia Fire Department. The park was created in the mid-1960s after the demolition of four 3- and 4-story commercial buildings that had stood on the northeast corner of 4th and Arch Streets. A firehouse was built on the corner lots, while the lot formerly occupied by 325 Arch was cleared. The park was improved following the 1976 grant of money from a city-held fund established by banker Stephen Girard (1750–1831) to improve areas near the Delaware River. An October 2009 photo looking south from within the park toward the fountain and the bust of Franklin. In 1971, a sculpture of Benjamin Franklin by local sculptor Reginald E. Beauchamp was installed atop the park's front wall. It was made of acrylic and covered with almost 80,000 pennies collected from local schoolchildren, and it incorporated a device that delivered a recorded two-minute speech on fire prevention at the push of a button. Penny Franklin was unveiled on June 10, 1971, by U.S. Mint Director Mary Brooks. Over the next two decades, the sculpture, also known as Penny Benny, became "one of the city's best-known landmarks." But it eventually deteriorated and became a potential hazard. For a while, the sculpture was kept from tumbling onto the sidewalk by ropes rigged by the firefighters from the firehouse next door. In 1996, it was removed to city storage. In 2003, the city's public arts agency commissioned sculptor James Peniston to replace the older work. Peniston sculpted a bust of Franklin in bronze and covered it with casts of 1,000 keys collected from local schoolchildren. Called Keys To Community, the one-ton sculpture also contains several brass nameplates representing Philadelphia firefighters fallen in the line of duty over four centuries. The sculpture was partially funded by the Fire Department and by more than 1.5 million pennies donated by schoolchildren in 500 area schools. It was unveiled and dedicated on October 5, 2007. The park itself had fallen into disrepair by the mid-1990s, and its gate was generally kept locked by the Fire Department. But a restoration effort, begun around 2005 and led by Old City residents Janet Kalter and Joe Schiavo, brought the park back into public use. In the wake of the sculpture's dedication, Fire Department officials consented to restoration work on the fountain. The work began in June 2008 and the fountain was restored to operation in August. The Fire Department formally returned the fountain to service in a Nov. 1 ceremony. A horseshoes pit has been added to the park. ^ "James Peniston Sculpture: Work: Keys To Community, 2007," retrieved 13 October 2007. ^ a b "Girard Fountain Park Now Re-open to Public!". Old City Civic Association. 2008-09-06. Archived from the original on 2011-07-17. Retrieved 2008-08-29. ^ "James Peniston Sculpture: Location: Keys To Community, 2007," retrieved 29 October 2007. ^ "Girard Fountain Park- Philadelphia, PA Image Gallery". Waymarking. Retrieved 2009-07-11. ^ "James Peniston Sculpture: Penny Franklin retrieved 29 October 2007. ^ "Mint Director Unveils Penny Franklin Sculpture." U.S. Treasury Department, June 10, 1971. Retrieved 29 October 2007. ^ "Big Heads," Scene on the Road Archived 2012-04-19 at the Wayback Machine, blog post by Philadelphia Inquirer photographer Tom Gralish, 22 October 2007. Retrieved 29 October 2007. ^ "Statue may return to mint condition," Philadelphia Inquirer, August 19, 2001. Retrieved 29 October 2007 via LexisNexis. ^ "Ben Franklin is busted," Archived 2016-03-03 at the Wayback Machine The Bulletin, October 9, 2007. Retrieved 29 October 2007. ^ Freeman, Amy (2009-09-02). "Parking". Phillyist. Retrieved 2009-09-03. Wikimedia Commons has media related to Girard Fountain Park. A history of the park's location at jepsculpture.com. Photo of buildings demolished to clear parkland, November 20, 1959, PhillyHistory.org. Photo of rear wall under construction, December 14, 1967, PhillyHistory.org. Photo of rear wall under construction, 1969, PhillyHistory.org. Photo of rear wall, completed, March 30, 1969, PhillyHistory.org. Photo of front wall with Penny Franklin sculpture, May 11, 1977, PhillyHistory.org. Photos of Keys To Community, 3 October 2007, Flickr.com. Keys To Community's entry at Philadelphia Public Art@philart.net. Before-and-after photos of restored park, August 2008, Flickr.com. 2009 photos of restored fountains. Rittenhouse Square is one of the five original open-space parks planned by William Penn and his surveyor Thomas Holme during the late 17th century in central Philadelphia. The park is considered one of the finest urban public spaces in the United States. The square cuts off 19th Street at Walnut Street and at a block above Manning Street. Its boundaries are 18th Street to the East, Walnut St. to the north, Rittenhouse Square West, originally called Southwest Square, Rittenhouse Square was renamed in 1825 after David Rittenhouse, a descendant of the first paper-maker in Philadelphia, the German immigrant William Rittenhouse. William Rittenhouses original paper-mill site is known as Rittenhousetown, located in the setting of Fairmount Park along Paper Mill Run. David Rittenhouse was a clockmaker and friend of the American Revolution, as well as a noted astronomer, in the early nineteenth century, as the city grew steadily from the Delaware River to the Schuylkill River, it became obvious that Rittenhouse Square would become a highly desirable address. Having thus set the patrician residential tone that would define the Square, he divided the rest of the land into generously proportioned building lots. Sold after the death, the Harper house became the home of the exclusive Rittenhouse Club. Today, the park is surrounded by high rise residences, luxury apartments, an office tower, a few popular restaurants, a Barnes & Noble bookstore, a Barneys. The park is a dog walking destination for area residents. The Square was discussed in a light by Jane Jacobs in her seminal work, The Death. The beauty of the Park is due largely to the efforts of Friends of Rittenhouse Square, lighting, restoration of fountains and fencing—even the installation and stocking of doggie-bag dispensers—are all projects of the Friends of Rittenhouse Square. During 2013, the 100th anniversary of architect Paul Crets redesign of the Square, New security cameras have cut down on vandalism, park rangers have helped calm behavior in the Square, and damaged balustrades and stonework are undergoing extensive restoration. Reginald E. Beauchamp was an American sculptor whose works include Penny Franklin, Whispering Bells of Freedom, and a bust of Connie Mack that sits in the Baseball Hall of Fame. Born in London, Beauchamp immigrated to the United States at age 2 with his family and he worked as the director of special events and the head of public relations and personnel at the Philadelphia Bulletin newspaper from 1945 to 1975. 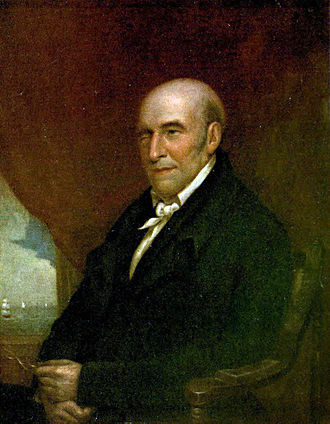 Beauchamp created 25 works of art, most of which were installed in Philadelphia. They include, The Living Flame Memorial, erected in 1976 in Franklin Square as the monument to honor city police. The Hero Mosaic in Philadelphia City Hall, the Vietnam Bronze War Memorial at Edison High School. The North Philly school lost 66 former students in the Vietnam War, tony Burgee, class of 1961, led the effort to create the memorial. The Signing of the Declaration of Independence paining at the Mellon Independence Center mall, a bronze of Dave Zinkoff, a veteran announcer of Philadelphia sporting events, at the Philadelphia Spectrum arena. A plastic glass spire at Mercy Philadelphia Hospital, Whispering Bells of Freedom, outside the African American Museum in downtown Philadelphia. In 1986, two Beauchamp bronze bas-reliefs of the face of Civil War hero George C. Platt were installed at the approaches to the George C. Platt Bridge over the Schuylkill River, both were stolen, the first in 1987, and the second some time later. A $500 reward offered by the Philadelphia Daily News in 2002 was unsuccessful in securing their return, Beauchamp once hung colored ribbons from the statue of William Penn atop Philadelphia City Hall to nearby buildings, creating the look of a maypole more than 500 feet tall. In 1967, he proposed a $5 million, 14-story bust of Benjamin Franklin to be mounted on Belmont Plateau in the citys Fairmount Park. It was to be made of vertical tubes, six inches in diameter and one inch apart. Another is Philadelphia Then & Now, a 53-by-68-inch painting commissioned by the Philadelphia Bulletin in 1947 to commemorate the newspapers 100th anniversary and it depicts the city as it appeared in 1847, with the contemporary skyline floating in the clouds above. Dilworth Park is a public space in Center City Philadelphia, along the west side of City Hall. Dilworth Park opened in September 2014 and it is named in honor of Richardson Dilworth, the 118th mayor of Philadelphia. The current park, designed by KieranTimberlake, Urban Engineers and OLIN replaces Dilworth Plaza, Dilworth Park contains Rosa Blanca Cafe, an outpost of Chef Jose Garces restaurant Rosa Blanca. An ice skating rink is open in the winter, Dilworth Park was built on the original Dilworth Plaza section of Philadelphia City Hall, which was built on the area designated by William Penn as Centre Square. It was a square from the citys founding in 1682 until the construction of City Hall began upon the site in 1871. It was one of the five original squares laid out on the city grid by Penn and it lay at the geographic heart of the city from 1682 until the Act of Consolidation,1854. Despite the two riverfronts [Delaware and Schuylkill, Penns city had a design, focusing on this central plaza. It is part of both the Washington Square West and Society Hill neighborhoods. In 2005, the National Park Service took over ownership and management of Washington Square and it is now part of Independence National Historical Park. During the Revolutionary War, the square was used as a ground for citizens. After the Revolution, victims of the yellow fever epidemics were interred here. Improvement efforts began in 1815, as the neighborhoods around the square were developed, in 1825, the park was named Washington Square in tribute to George Washington and a monument to Washington was proposed. This monument was never built but served as the seed for the tribute to soldiers of the Revolutionary War. Washington Square included an area called Lawyers Row at 6th and Walnut, the square was home to the citys publishing industry, including the Curtis Publishing Company, J. B. Saunders, Lea & Febiger, the Farm Journal, and George T. Bisel Co. law publishers, now the sole remaining publishing house on the Square and it has been located there since 1876 and still owned by the Bisel family. Fitler Square is a 0.5 acre public park in Philadelphia, bounded on the east by 23rd Street, on the west by 24th Street, on the north by Panama Street, and on the south by Pine Street. It is in the part of Philadelphias Center City on land owned by City of Philadelphia via the Department of Parks. Fitler Square was named for late 19th century Philadelphia mayor Edwin Henry Fitler shortly after his death in 1896, the Square is cared for through a public private partnership between the Department of Parks and Recreation and the Fitler Square Improvement Association. The portion of Center City surrounding Fitler Square and nearby Rittenhouse Square is sometimes referred to as Rit-Fit after the two parks, a second nickname, Fittenhouse Square, was coined by local comedian Niraj Shanbhag during the 1990s. Before the 1950s the neighborhood was a example of the urban blight that had overcome much of the city. The park itself was described as a mudhole inhabited by drunks, in the mid-1950s, The Center City Residents Association successfully petitioned Mayor Clark to do something about the decline of the neighborhood. Working together, they freed up mortgage money for the construction of new homes, threatening the neighborhood was the proposed Crosstown Expressway. The threat of its construction, which would demolish much of the neighborhood, was enough to reduce property values, today the neighborhood is mostly residential, composed of single-family homes, and within a short walk of the commercial areas of Center City. On the television show Philly, Kim Delaneys character Kathleen was portrayed as living in an apartment overlooking the park. Hojun Li, co-editor of the film The Sixth Sense, claims to have inspired by children in Fitler Square. The Fitler Square Improvement Association was founded in 1962 by neighborhood resident Marie Wilson who took on the responsibility for major overhaul of Fitler Square itself. In 2012 The Association celebrated its 50th Anniversary under the leadership of president Judy Romano and this celebration included a large tented in-square event on October 6,2012 that raised a net of about $18,000 for use toward the improvement and maintenance of Fitler Square. Horseshoes is an outdoor game played between two people using four horseshoes and two throwing targets set in a lawn or sandbox area. The game is played by the alternating turns tossing horseshoes at stakes in the ground. Modern games use a more stylized U-shaped bar, about twice the size of an actual horseshoe, there are other entities that have their own versions of the game and sanction their own events, but the largest recognized volume of sanctioned tournaments and leagues are those of the NHPA. The game begins with a toss to decide who goes first. The winner of the throws both horseshoes—one at a time—at the opposite stake, and the second player throws both of their horseshoes—again, one at a time—at their end. After scoring, the round is done in reverse order. Play continues until one player has at least 15 points at the end of a round, NHPA sanctioned games are generally played to 40 points, or a shoe limit of 40 or 50 shoes. 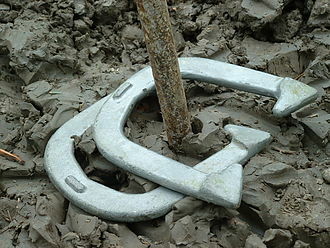 The horseshoes can be made of plastic or metal. In horseshoes, there are two ways to score, by throwing ringers or by throwing the horseshoe nearest to the stake, a ringer is a thrown horseshoe such that the horseshoe completely encircles the stake. Disputes are settled by using a straightedge to touch the two points at the ends of the horseshoe, called heel calks, if the straightedge doesnt touch the stake, the horseshoe is a ringer. One player pitches both shoes in succession to one pit, followed by the other player and this is formally called an inning. Normally only one pitcher can score points per inning, however some leagues and tournaments play count all, a live shoe that is not a ringer, but comes to rest six inches or closer to the stake, has a value of one point. If both of one players horseshoes are closer than the opponents, two points are scored, in the case of one ringer and a closer horseshoe, both horseshoes are scored for a total of four points. If a player throws two ringers, that player scores six points, if each player throws a ringer, the ringers cancel and no points are scored. If two ringers are thrown by one player and one ringer by the opponent, the player throwing two ringers scores three points and this is typically called two dead and three or three ringers three for score keeping purposes. Franklin Square is one of the five original open-space parks planned by William Penn when he laid out the city of Philadelphia, Pennsylvania in 1682. It is located in the Center City area, between North 6th and 7th Streets, and between Race Street and the Vine Street Expressway, the park went through a period of deterioration, but was refurbished and revitalized in 2006. It is now managed by Historic Philadelphia, a non-profit organization, Franklin Square was added to the National Register of Historic Places in 1981. Originally called North East Publick Square, Franklin Square was renamed in 1825 to honor Benjamin Franklin, in its early years, the square was an open common used for grazing animals, storing gunpowder during the American Revolution and drilling soldiers during the War of 1812. From 1741 to 1835, a portion of the Square was used as a cemetery by the German Reformed Church, some of the graves still remain, marked by a plaque. The construction of the Ben Franklin Bridge, from 1922–26, leveled blocks of row homes and other structures, in 1961, writer Jane Jacobs labeled Franklin Square the citys Skid Row park, a description that fit for decades. The neighborhood’s residential character was further eroded when the Federal government established Independence Mall, the government acquired private land around the Square in the 1950s and 1960s and demolished blocks of homes and other buildings. The construction of the Vine Street Expressway in the late 1980s exacerbated the problem, Franklin Square became the least-used of Penn’s original five squares, and served mainly as an encampment for the homeless. It was reopened and rededicated on July 31,2006, in Franklin’s tercentenary year, the revitalized park contains a number of family-friendly attractions. As a result, pedestrian traffic has increased dramatically, local legend maintains that Franklin Square is where Benjamin Franklin conducted his famous, though misunderstood and key experiment in 1752. However, it would have been unlikely for Franklin to fly a kite near a cemetery, the legend is memorialized in Isamu Noguchi’s Bolt of Lightning. A Memorial to Benjamin Franklin, a 101-foot tall, 60-ton stainless steel sculpture commissioned by the Fairmount Park Art Association and costing $850,000. Horseshoe tournament on Sheffield Field Day, September 4 (Labor Day), 2017 in Sheffield, Vermont. Fox Chase Farm Manor House. October 2012. 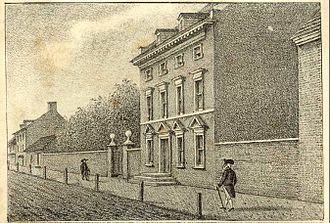 The President's House, which served as the presidential mansion of George Washington, 1790-97, and John Adams, 1797-1800. Penn Treaty Park with a statue of William Penn to the left and the Ben Franklin Bridge in the distance. 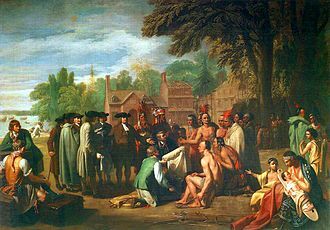 Penn's Treaty with the Indians (1771-72) by Benjamin West, Pennsylvania Academy of the Fine Arts. "Penn's Treaty with the Indians" by Edward Hicks, 1837. Hicks also included the subject in many of the 61 versions of his "Peaceable Kingdom."